I love one pot dinners. I especially love one pot dinners that don’t take long, where you just fire everything into it and it’s ready as soon as you are finished adding the last ingredient. Most of our winter dinners are one pot wonders: stews, braises, casseroles, goulash and our favourite, curries. Although we eat curries all year around, a fresh fragrant spring alternative to the more wintery madras or tikka is a Thai green curry. Thankfully the girls love curry, although the kitchen looks like a bomb hit a paddy field after dinner if we have rice. It’s worth it though. My daughter Elly is lactose intolerant and these curries are great because they use coconut milk and are dairy free. Like any dish, a good curry needs good ingredients. I almost always use chicken thighs and drumsticks for any chicken dish that is made in a pot with sauce. Curry is no exception. Always try and buy the best chicken you can. A proper pasture-reared chicken (like The Friendly Farmer’s from Athenry) will always go much further than a conventional chicken of the same weight. This is what I’ve found when cooking at home. The meat is denser in a free-range chicken and there is nothing but delicious cooking juices in the bottom of your roasting tin instead of that volume of suspicious looking clear liquid that you get with some conventional chickens. Of course, if you prefer chicken breast substitute these for the thighs. Consider buying a whole chicken at your local butcher and getting them to take off the breasts for you and boning the thighs and drumsticks for a dish like chicken curry or a casserole. You can also add the carcase to the pot when making your casserole for stock and remove it at the end. To make the curry itself, I would steer clear of ready-made curry sauces. They are mostly disappointing. The only exception to this I find are Green Saffron ready-made sauces from Cork which include in the range a Korma that is really wonderful. 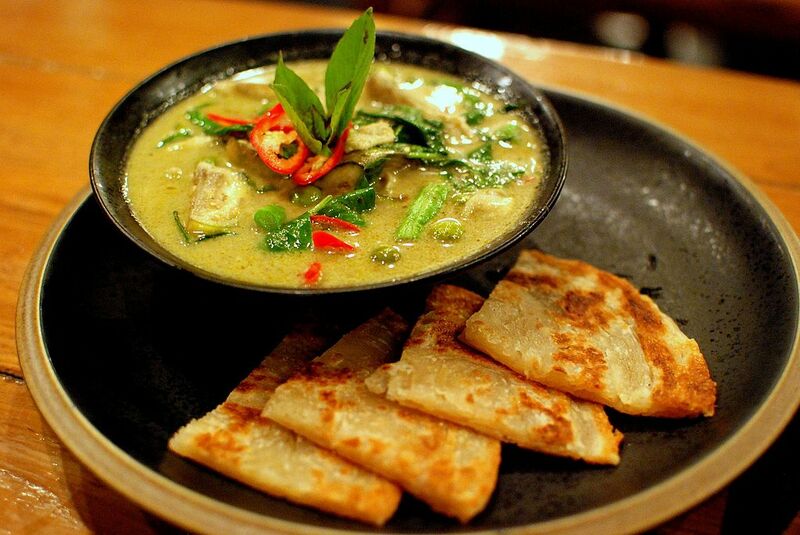 What we generally use for Thai curries are good quality pastes. One good brand is Mae Ploy that’s available in most supermarkets. The following recipe is for a curry that serves 4 and takes 15 minutes to prepare and 15 minutes to cook. Not bad on a busy week night and the rice will be cooked in the 30 minutes. Perfect timing! Heat the olive oil in a large heavy bottomed saucepan. Add the curry paste and stir over a hot heat for one minute. Gradually add the coconut milk to the paste. It is important to do this slowly so that the paste and the coconut milk don’t separate. Then add the chicken strips to the saucepan. Drain the bamboo shoots and add to the pan followed by the frozen peas. Simmer for 10 minutes. Add the fish sauce, taste and adjust seasoning to your liking. Sprinkle the curry with sweet basil and serve with rice. Return of the tea salad. In my house when I was small, you knew the weather was getting warmer not just from looking outside, but when the big hearty winter dinner was replaced with the tea salad. We didn’t call it a tea salad of course – it was just called ‘salad’ because it was the only form of salad available. It was the 1980s and the avant-garde tossed salad of the roaring 90s hadn’t arrived in Connemara yet. We felt incredibly sophisticated to have on our plates a leaf of butter head lettuce acting as a bowl to a small scoop of Heinz’s tinned potato salad. Slices of ham were rolled and propped up by a plain tomato cut in half or maybe quarters. Our mother would have boiled eggs earlier in the day and you watched them cooling in the saucepan wondering if they were going to be made into egg mayonnaise sandwiches or not… our favourite. If they made the salad, they were simply shelled and cut in half. We weren’t really Heinz salad cream people but more Hellman’s. There was any amount of homemade brown bread and warm tea. There were no dressings or oils or lollo rosso or radicchio but looking back on it, we loved those evenings. 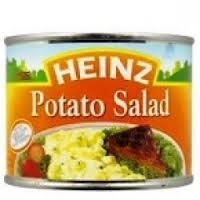 I went looking for a can of Heinz potato salad the other day but couldn’t find one. I wanted to see if it tasted the same. I’m glad I didn’t find it. Warm weather food has taken on a different form today. After a day’s work, if the weather is good it’s a wonderful thing to come home and cook something that is quick to prepare, tasty and light but still filling. It gives you time to spend outside. What we love in our house are kebabs or skewers that can be partially prepared in advance, usually the night before, by marinating the meat and then skewering on wooden skewers just before a very quick cook under a hot grill. They can be accompanied by noodles or homemade coleslaw or potato salad (Heinz or otherwise) or a green salad. A favourite skewer of ours in the shop doesn’t require overnight marinating but does require a food processor. Turn your grill on full blast. Soak 8 wooden skewers in a tray of water. If they float, place a plate on top to submerge them. 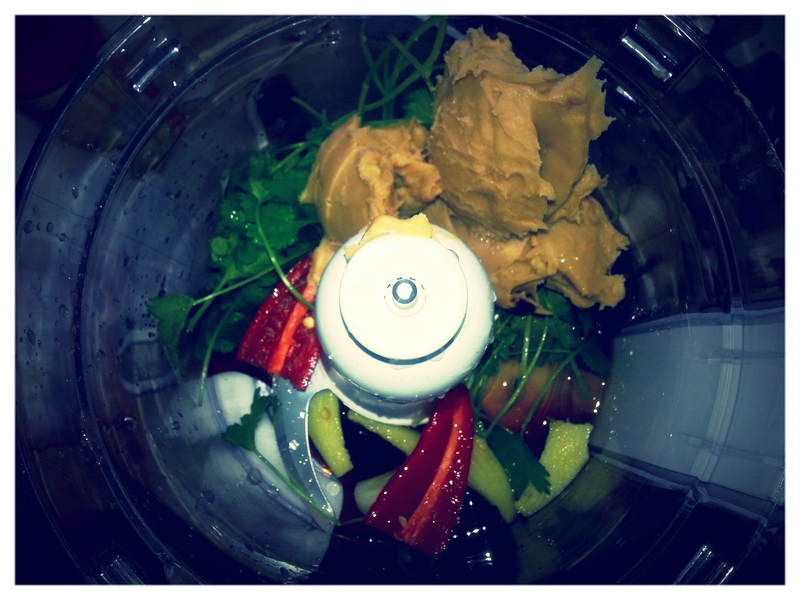 Assemble the food processor with the standard blade. Add the coriander, stalks and all; the red chilli stalk removed; the peeled garlic clove; the 3 tablespoons of crunchy peanut butter; the glug of soy sauce; the roughly chopped piece of ginger; the zest of the 2 limes and the juice of one. Add a couple of splashes of water to help blitz it to a reasonably thick sauce consistency. Adjust seasoning if required. Put half of this sauce to one side for accompaniment for the cooked kebabs. To the other half of the sauce, add the evenly diced chicken fillets (you will get about 6 pieces from each fillet). Coat all the pieces evenly with the sauce. Place about 3 pieces on each skewer, alternating them with a large chunk of pineapple if using. This will give you two kebabs per person. Place under the hot grill for about 8 to 10 minutes each side or until bubbling golden and cooked through. You can check the thickest piece of chicken to make sure. Serve with a noodle salad or rice. Spoon some of the reserved satay sauce over the kebabs at the table. The kids will love them. Now we just have to wait for the weather!